Along with the menhirs, stone circles, and kists of Dartmoor are the associated stone rows. It is estimated that there are 76 known stone rows and avenues all of which seem to have been built over a lengthy period of time. It is always difficult to date these features but it can be considered that some of them date to late Neolithic times. At Hook Lake is an example of a Bronze Age enclosure being built against an older disused stone row thus pre-dating it and suggesting an earlier construction date. The stone rows vary in design and range from single to triple and quadruple alignments and range from a few metres to 3.32 kilometres in length. Many of the rows are directly associated with ring cairns and their burial kists but there is a possibility that these were added at a later date. Very little excavation work has been carried out on the rows with only the Cholwichtown row being examined. Despite work being carried out on the whole length of the row and its surroundings nothing conclusive was discovered. There was evidence of 38 sockets from which the stones had been removed and pollen analysis revealed that at one time the row stood in a oak wood clearing in which cereals had been cultivated. A phosphate test on the Holne Moor row revealed the possibility of a burial but this result was thought to be tenuous to say the least. In 1979, Emmett produced a paper which compared every aspect of 61 of the Dartmoor stone rows. In it he classified the rows into three types, single rows, double rows, and triple and complex rows or in other words alignments with either one, two, and three or more lines of stones. “There are nine rows with ends which are not intervisible and others with ends which do not appear on the skyline from any point along their length. The environmental evidence suggesting siting in forest clearings and the irregular nature of the rows also make sighting along the rows impossible. The use of long single rows for sighting to distant marks is impractical, while the hilltop and slope sighting of many rows results in a changing horizon vista along their lengths. An extra problem is the variety of available distant sighting marks: standing stones – ancient and modern; horizons full of notches, outcrops, skyline cairns – all the trade mark of the alignment seekers, who rarely consider the possibility of changes in the skyline over three millennia“. “It is difficult to avoid the un-shattering conclusion that the rows merely run roughly downhill, towards the limits of the granite, and that the orientation is the result of such casual siting. Gaps in the orientation range can then be interpreted as the result of corresponding gaps in stone row distribution; the lack of north-west and south-east orientations being due to the few known rows in those parts of the moor“. So what was the purpose of the stone rows? There are numerous explanations all of which are supposition, Aileen Fox considered that the shorter rows associated with cairn burials, as in the case of Merrivale, provided a dignified approach to the grave. In this case the width of the double stone row would have allowed only one or two people to process along its length. She also thought that the long stone rows such as on Staldon acted as tribal divisions of grazing rights. One consistency that Burl, (2000 pp.152-3) seems to have found is that at the entrance to many circles are a flat-topped pillar on one side and a pointed one on the other. There also is a similar occurrence in stone rows where lines of taller stones stand opposite to shorter ones ,both phenomenon could indicate some kind of sexual symbolisation. This could mean that the actual stones were acting as some kind of signpost indicating that the males approached and entered the circle on one side and the females on the other. If this was the case then it would be safe to assume that both men and women took part in the rites and rituals held at the circles. “Monuments played a fundamental role in the organisation of prehistoric landscape, helping to mark and characterise important places in the perceived scheme of things. They were key elements in ‘sacred geographies’: landscapes changed with meaning. By understanding symbolic associations between monuments and the natural landscape around them we may hope to gain insights into the prevailing world-view. But non-western world-views do not separate the land and the sky; astronomy is an integral part of every indigenous cosmology, and this means that we are unwise to study sacred landscapes in isolation from the sky“. The question that puzzles me is why do some some rows contain single lines of stones and others two, three or more? I can go along with the processional theory and the double rows but what was the thinking behind triple rows such as that on Cosdon? Clearly a lot more investigation needs to be carried out on these features and until that is done we cannot hope to postulate on their original purpose. I would love to see a complete pollen analysis of the areas where the Dartmoor stone rows occur. That way it would be possible to establish in what landscape setting they were constructed. If as the single example of such an analysis indicates, ie the row was built in a woodland clearing once used for cereal production, could this be some sort of ‘final closure’ act. The ground had become infertile or in effect ‘died’ and so became an appropriate sort of sacred place to inter the dead? To me this question of what the landscape originally looked like is the key to the whole debate. We cannot possibly begin to talk about celestial alignments, territory markers etc until it can be established exactly how visible the rows were and what could be seen from them. A few years ago I attended a seminar in which Dr. Vicki Cummings was talking about prehistoric burial sites in West Wales. She commentated that if such features were occurring in woodland clearings there may even be the argument that what could be seen from the site would vary throughout the seasons. For instance, during the late spring and summer months the foliage of the trees would obscure any alignment with landscape features. But once the leaves had fallen it may be possible to see landscape features through the bare branches thus giving another possible interpretation to the purpose of the feature. To put this into a Dartmoor context, take the Merrivale complex, if this was situated in a woodland clearing then all of the landscape features would be obscured when the leaves were on the trees. This would be at what would be presumed to be a fruitful time of year, food was freely available and long sunny days prevailed. Nobody would be looking for any spiritual assistance as everything in the garden was rosy. But come the winter months when days were dark, the nights long, food supplies were dwindling and evil lurked everywhere, would this not be the time to seek spiritual aid and comfort? I would suggest it might be, and now when visiting the ritual features the trees would be bare and just maybe it would be possible to see the ‘sacred topography’ and any special alignment. Burl, A. 2000 The Stone Circles of Britain, Yale University Press, Yale. 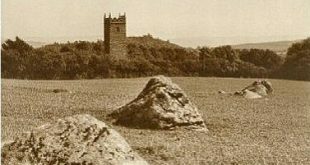 Emmett, D. D. 1979 Stone Rows – The Traditional View Reconsidered, Devon Archaeological Society, No.37, Torquay. pp 94 – 114. Fox, A. 1973 S. W. England, 3,500BC – AD600, David & Charles, Newton Abbot. pp 68 – 74. Walker, J. 2005 Dartmoor Sun, Halsgrove Pub., Tiverton.